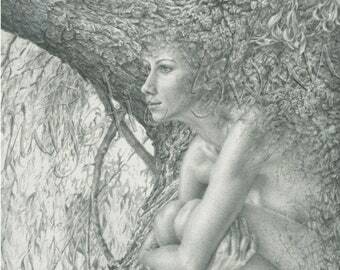 Giclee Print "Anticipation" from "Spirits Within Series"
Announcement Imagine visiting a world filled with faeries, dragons, mermaids and more. That is the place where I find myself while sculpting and drawing these mystical figures. 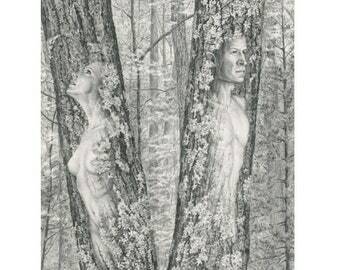 Working in two medium; my drawings are available as giclee prints, while my sculptures are done in wax and later cast them in sterling silver. Fantasy jewelry featuring amazing sculptures in miniature which are made to be worn and detailed graphite drawings to enhance your surroundings. If you see something that you really like, but don't feel that you can afford to make the purchase all at once, you may want to consider a layaway plan. Etsy doesn't have a layaway option, but if you contact me directly I'll be happy to workout an installment plan with you by making payments through PayPal. Imagine visiting a world filled with faeries, dragons, mermaids and more. That is the place where I find myself while sculpting and drawing these mystical figures. 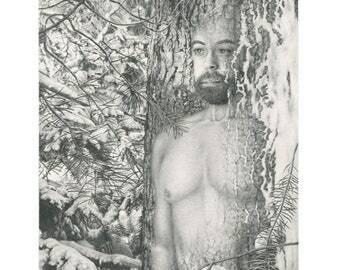 Working in two medium; my drawings are available as giclee prints, while my sculptures are done in wax and later cast them in sterling silver. 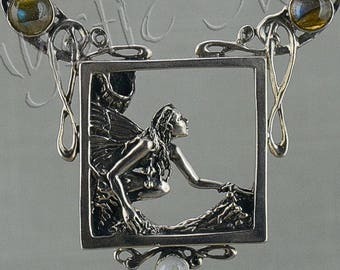 Fantasy jewelry featuring amazing sculptures in miniature which are made to be worn and detailed graphite drawings to enhance your surroundings. Giclee Print "Maybe Tomorrow" from "Spirits Within Series"
Giclee Print "Sentience" from "Spirits Within Series"
Giclee Print "Introspection" from "Spirits Within Series"
Giclee Print "Solitude" from "Spirits Within Series"
Giclee Print "Sentinel" from "Spirits Within Series"
Giclee Print "Guardians" from "Spirits Within Series"
I love this piece of jewellery art. Sharon is very helpful and a great artist/seller. Thank you for the beautiful Citrine gemstone ordered in to represent the moon. 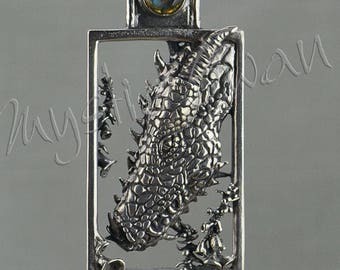 As with my other pendants I can wear this on my vine entwined neck wire - looks gorgeous. Received my pendant in attractive box with silver cleaning cloth folded on top and tied with silver thread and also enclosed a lovely piece of Citrine which will join my crystals on the mantlepiece. Many thanks. these wonderful pieces as they appeal to the child & artist in me. I love this! I wore my triple dragons necklace to a Kings game in LA last night & Security stopped me to admire the necklace. Again the vendor @ the refreshments stand had to look. They loved the detail. I always get comments with your marvelous jewelry. Thank you for loving fairies & dragons as much as I do!! Freshly cast Faerie and Rabbit. When a piece is cast and after the plaster is cleaned off, it goes in the "pickle" which removes the oxidation and brings the fine silver to the surface giving it a white tone. The silver shine will appear with polishing. 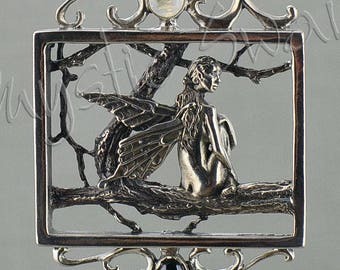 Completed wax of Faerie and Swan Pendant. Next sprues need to be added, then it will be ready to cast. The idea and a beginning sketch are the first part of the process -- I love being inspired by a new idea. Inspirations that travel from thought through wax to metal to wearable works of art. I've always been an artist. I've worked in a wide variety of media, but always felt I was strictly a two-dimensional designer specializing in pen & ink as well as computer design -- that is, until I took a jewelry class. I had been working with hand painted textiles and adding beadwork to them, but unhappy with the durability of my end product so took a jewelry class to see if I could learn any techniques to make those pesky beads stay on securely. After my very first night of class I had found a new passion - making jewelry. So that was the beginning of my journey into the world of jewelry and sculpture in miniature. My work has evolved a great deal since that first class and I'm excited to keep following my path to see where it leads and what wonderful characters I will get to know and create along the way. It's just me -- I'm the one that draws out the designs and I sculpt the wax for each jewelry design and cast it, I do all the photography, and package each order. My favorite part of the process is being inspired by a new idea and sculpting wax. In order to be able to focus my time on design and sculpting I use this small business to cast some of my items. 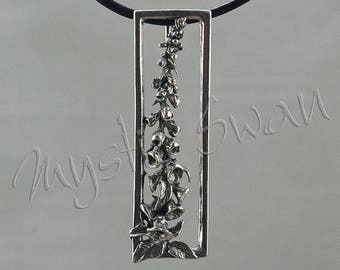 I hope that you enjoy browsing through Mystic Swan Jewelry. I offer inspired designs that are expertly crafted and if you decide to make a purchase I want you to be as pleased with my creations as I am. Orders are usually filled in 2-5 business days (I am often away from my studio on weekends) if you need something mailed more quickly please contact me and I will let you know if it is possible. If you have any questions on a specific piece or on my work in general please contact me. I want you to be absolutely delighted with whatever piece you order, if you don't like it for any reason please return it to me within 10 days of it's arrival and I will give you a full refund. The exception to this are items that have been customized for you, such as a specific stone that has been set or an unusual size in a ring or neck wire. I will cancel an order if you do so before I have it mailed and as long as the order has not been customized for you in some way, such as a specific stone set or a ring or neck wire size that is an unusual size. If you see something you love and it's outside of your budget contact me; while I don't lower my prices or have sales I can work out a payment plan for you and have done this for many of my customers. United States Orders -- all orders will be mailed via USPS First Class Mail. Unless you are having your item customized most orders arrive within a week. International Orders -- most orders are mailed via USPS Frist Class Mail, there may be exceptions for some countries depending on their regulations. On average expect a delivery time of approximately 1-3 weeks, however, there have been times when it's taken as long as 6 weeks for a package to arrive. Any import tariffs or taxes are the responsibility of the purchaser, which vary widely depending on the country. The import tariffs and taxes are quite high some countries. VAT can be as much as 20% of the purchase price, please note this is NOT included in shipping fees, the cost for shipping is my cost for mailing the package to you. Any other fees that may be incurred are the responsibility of the purchaser.